In my previous blog post, “Don’t Wait For Your Leaders,” I said that most top leaders will never “get it” when it comes to Lean management. Why is that? It is a highly negative message for leaders, one that quickly provokes an emotional reaction rather than a thoughtful intellectual response. Most top leaders, with decades of experience and decades of positive feedback, cannot accept this message and will therefore resist Lean. (Thankfully, a few leaders will quickly agree that they have been doing a bad job and want to learn how to do a good job). 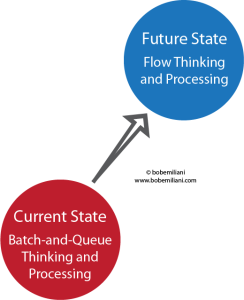 Lean is more advanced way to think and do things compared to conventional management that defines the current state. This is nearly impossible to comprehend by top leaders who are fully vested in the current state in knowledge, practice, and ego. I think the more appropriate message to top leaders is that you did a fine job in the days when your company and industry were the only or at least the main game in town and batch-and-queue thinking and processing were adequate to meet the customer demand. Now in a world of global competition, if you continue with the status quo, then you will be doing a bad job and everything you know and continue to do is wrong. Just for clarification, I did not mean that should be the message given to given to top leaders. Rather, it is the message that most top leaders perceive even if the explicit message is as you say or even something that is non-threatening. I understand. The reason for my comment is that I find the message in your article to be sadly true but in my experience bottom up implementation of lean is very difficult in the context of top leaders who don’t “get it. ” That is why I am an advocate for pragmatic communication with them instead of merely struggling along.